All these years later, I still don't understand how Everything But The Girl found a different horse in the middle of the stream of their fifteen plus year career. I know it happened somewhere around the time Todd Terry remixed 'Missing' from a sculptural acoustic guitar original into a modern house track with a locomotive drum loop that was imitated for years. I love the soulful contributions Everything But The Girl have made to trip hop and drum and bass, but I love them a little more for the folk-meets-lounge pop that came first. Like many in the U.S., I suspect, I first became aware of EBTG in 1988 when I heard 'Apron strings' - not the version on Idlewild, but the new version recorded for the brilliant soundtrack of She's Having A Baby. That song is an excellent introduction to the duo, showcasing their skillful but not showy songwriting and penetrating lyrics that have prompted me on many occasions to compare them to Virginia Woolf. Every time I read Woolf I am amazed by her ability to use the most mundane moments in her characters' lives, revealing the intricacies of their emotions and relationships with the most ephemeral details. Everything But The Girl has regularly demonstrated the ability to etch memorable characters with the same economy and grace - one is tempted to consider them autobiographies, they ring so true. Eventually I found my way back to their earlier albums, but I'm almost glad that I heard their Acoustic album first, because that album's live version of 'Fascination' is superior to the original from their first album, Eden or Everything But The Girl, depending on which side of the Atlantic you purchased it. Like 'Apron strings' it presents an achingly personal moment that telescopes effortlessly to universal heft and truth. There are very few pop songs that attempt the 5/4 time signature - the syncopated guitar of 'Fascination' references the other great example: Paul Desmond and Dave Brubeck's 'Take 5', (though while it was a smash hit single, it's not really pop) and makes an equally strong case for how effectively the signature can be used. In unskilled hands it's a very jarring meter, but 'Fascination' makes excellent use of the unusual structure to subtly underline the awkward theme of the lyrics. 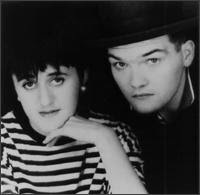 As a singer, Tracey Thorn ranges from an alto bleat to a breathy soprano, but her limitations are clear, and she and Ben know very well how to transcend them. One of the reasons she succeeds as a vocalist is that she writes and selects material that portrays characters as tentative as she sounds: the woman who has moved into a hotel in the wake of a break-up ('Single'); the woman who struggles to accommodate her lover's volatility ('Troubled mind'); the woman who implores a man to leave his wife and children ('Meet me in the morning'); the woman lost in an abusive relationship ('Never could have been worse'). In 'Fascination' she is the woman who cannot forget that she is not her love's first love, and who struggles to enjoy the present and leave sleeping dogs lie. 'I won't try to stop you when you speak of the past / Doubt is over now and I can join in when you laugh / Fascination makes us ask for more than we'd like to know / But I needn't explain / I bet you know'. The original lyric is 'I think you know'; in the live version Tracey sings 'bet', adding another facet of speculation and a shade of bitterness to the character study. The second verse ends with the parallel 'Did you know? ', betraying this woman's equivocation and unease. We all have had moments when we are reminded of the time before our lover met us; it might be an offhand comment, or a visit to a place we know predates us. That glimpse of a time when our lover was happy with someone else - it can become quicksand if we let it, and the woman in 'Fascination' is treading the edge, knowing she endangers herself. She also realizes that her lover may feel the same way, but quickly returns to her own insecurities. 'There must be so much I know that you cannot forget / And I mustn't wish your life began the day we met'. She even goes so far as to try to prove that she is comfortable when she really isn't, faking it in hopes of fooling herself as much as anyone else. On Idlewild 'Fascination' is a little heavy; it is beautiful but not as rich in the treble range, and it doesn't achieve the same delicacy as the live version. The subtraction of the doubled acoustic guitar parts serve to purify it. And the replacement of the distracting alto saxophone with an uncompetitive desultory soprano sax is a marked improvement. I've read that Everything But The Girl took their name from a sign in a shop that sold a wide variety of feminine things. It's a brilliant choice because their best songs invariably present women who are fully formed, beautifully nuanced and disarmingly familiar. Their first decade of material is a treasure trove of gems like 'Fascination'.